When you think Nike, you think sport and with CrossFit becoming more mainstream, it would make sense for Nike to enter the market. 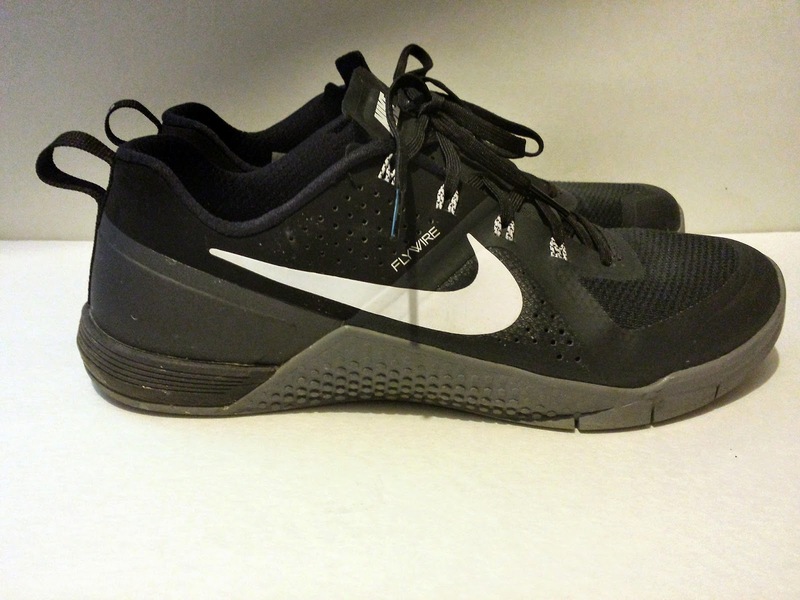 I think it is safe to say the Nike MetCon 1 is one of the most sought after CrossFit shoes. The marketing hype combined with the limited number of shoes available at launch made them that much more desirable. I felt like I was trying to buy a pair of new Kobe’s or Jordans rather than a pair of CrossFit shoes. If you didn’t get a pair within the first hour of launch, you were out of luck. Thankfully, my fiance manged to order a pair online and they have been my go to CrossFit shoe for a few weeks. The Anthracite/Black/Cool Grey colorway are my favorite colors from the launch. The shoe has a unique color pattern with the shoe divided up in four sections. The divisions are more noticeable with the other colorways. Ordering shoes online is risky especially when it comes to new shoe models. Thankfully the shoe felt true to size. The shoe fits snug but after you break them in, they feel great. The toe box has enough room to spread your toes which is great for lifts. The shoe is also wider which allows for a stable base. Since this is a Nike shoe, you’re bound to see some of their tech. The shoe features Flywire, which helps to lock your feet down and gives support to certain areas of the foot. 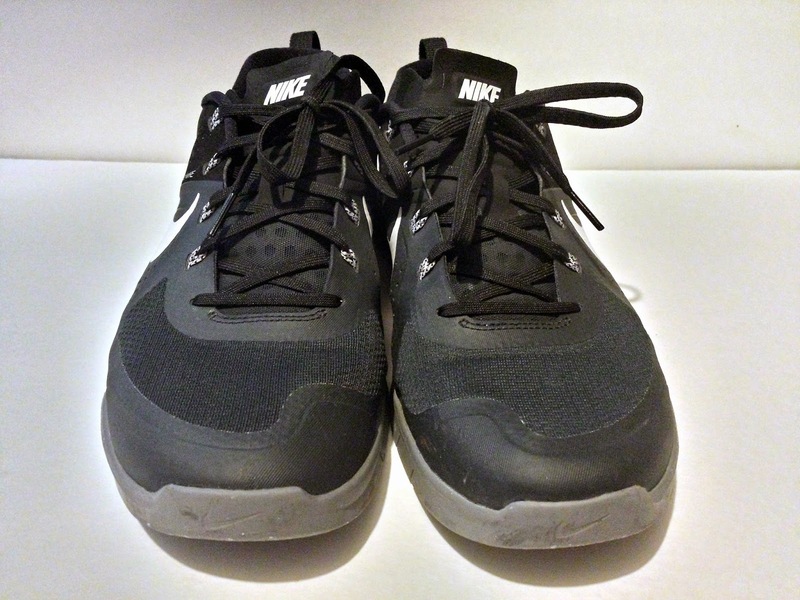 A Hyperfuse upper and a rubber midsole is more for rope climbs. 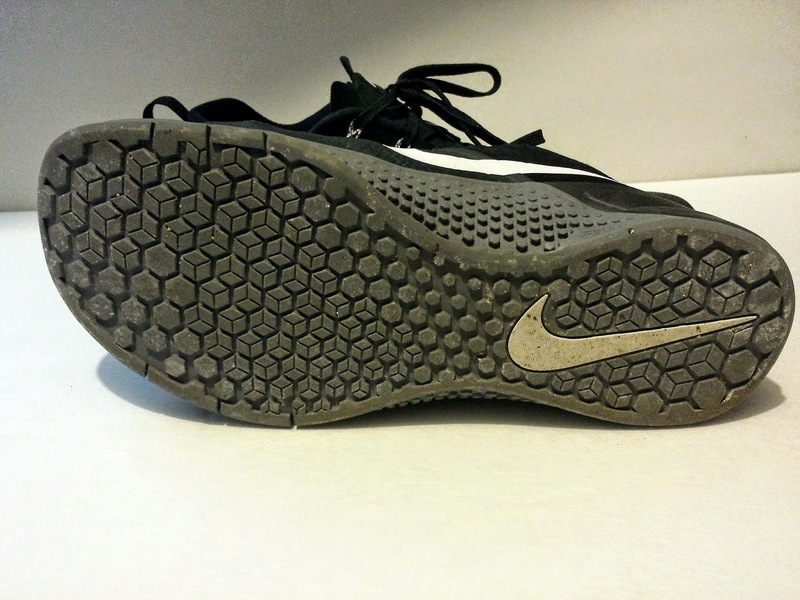 The newer Flyknit material would probably rip after a few rope climbs making the Hyperfuse upper ideal. After a few weeks of use, the shoes almost look brand new. The excellent shoe quality is what I expect from Nike. My first workout in the Metcon 1 was great for a performance test. It was a FGB style workout with wall balls, thrusters, rowing, double unders, burpees and box jumps. Throughout the workout the shoes held up great. I felt stable during all movements. I had no problem jumping during box jumps, it also had a slight spring. The shoes perform well during heavy oly lifts and heavy squats. I felt stable in the bottom position of the lift and the shoe didn’t give as much as I was expecting. The insole is a little thick but the heel area felt solid during lifts. The shoes have great grip and the sticky rubber soles are indeed sticky. I didn’t feel my feet slide around during split jerks or lunges. The midsole grip felt great during rope climbs and the upper held up. Checking the shoes after, it didn’t have any scratches or tears. During a run however, I noticed most of the flaws of this shoe. My feet felt heavier during runs and the rigidness of the sole is not comfortable. If I know running will be programmed for the day I will use different shoes. The Metcon 1 is a great shoe and is now my favorite shoe to use during CrossFit. It covers almost all workouts except for running. They are holding up well and if I wipe them down with a damp cloth, they will look good as new. I’ve read that the newer versions of the Metcon 1 have some changes to material and construction. I plan to get another pair in another color, and I will update this post if I think the changes will make a difference. My next shoe review will be on the Fastlift 335. Hopefully it will be done in a few weeks. If you have any questions or comments, enter them below. Previous Article CrossFit Progress: Power Clean PR! Great review as usual. Trying to decide between the Metcon's and Inov-8 235's. If you could have only one shoe for lifts/jumps and some running (mainly sprints) which would be your choice? I would pick the Metcon 1. The stability on the lifts is worth it and running short distances is not bad. Both shoes are great but I would pick the Metcon's.